This year, our Create a Commuter program marked ten years of broadening access to bicycling. We’re riding right into the next ten years with a slate of workshops organized with returning and new partners, new bicycles, and additional production support provided by our Guest Mechanic Program. Our first workshop of the Fall will be held on September 26th with Portland Youth Builders. Portland Youth Builders supports low-income youth ages 17-24 as they work towards self-sufficiency. We’re excited to continue working with them, as their innovative program fits perfectly with Create a Commuter. Later in the fall we’ll hold workshops with the Native American Youth and Family Center, Home Forward (formerly the Portland Housing Authority) and a new partner, Easter Seals’ Latino Connection program. Many participants in our upcoming workshops will be receiving new bikes. With the current recession, there has been a significant decline in the donations of high-end bicycles to refurbish, leading to inconsistencies in the quality of bicycles provided to Create a Commuter participants. With new bicycles, all participants can receive the same high quality. The KHS Urban X was chosen by our mechanics as the perfect bicycle for Create a Commuter because it comes complete with a rack and fenders, has a solid steel frame, and is available in a wide size range. Our new Guest Mechanic Program has been of great assistance in producing bicycles for our upcoming workshops. Guest Mechanics are volunteers who have been previously certified as Holiday Bike Drive mechanics. Volunteering for three hours a week, Guest Mechanics work closely with our talented staff mechanics to build up Create a Commuter bicycles, gaining skills in wheel truing, brake and derailer adjustments, and out-of-the-box production. We’re very lucky to have such committed and skilled volunteers! With the help of the Community Cycling Center’s generous funders and donors, Create a Commuter will distribute 169 bicycles from September until next June. 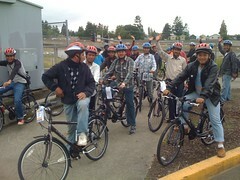 We look forward to another ten years of Create a Commuter empowering participants to commute by bicycle.